The disappointment came from the two dropped points, with many of us expecting it to cost Arsenal third place in the Premier League. The fear was derived from the speculation around the captain, Robin Van Persie. As he walked around the pitch, you could feel the palpable terror. Was this to be the last time we saw him in an Arsenal shirt? Fans begun to play amateur psychologist; with his two young children in tow, Van Persie waved to the crowd. But what did it all mean? Was it a wave of appreciation? Was it a farewell? Was it neither? Had he not made up his mind about his future and was just hedging his bets? In the midst of all this fretfulness, it was almost forgotten that bringing up the rear as Arsenal's personnel walked around the pitch, was Pat Rice. While not yet confirmed, it seems to be the worst kept secret in the red side of North London that Rice will be retiring at the end of the season, after 42 years of service. The Northern Irishman joined the club as a player back in 1966, and bar a 4 year spell as a player at Watford, he's been a permanent part of the furniture in N5. A part of the legendary double winning side of 1971, as well as captaining the 1979 team that won the FA Cup - which, by the way, is worth a trip to YouTube if you've never seen how that game ended. After retiring as a player, he immediately became part of Arsenal's coaching staff, spending most of the time in charge of the youth team. But his value to the club became apparent during the 1994/95 season, one of the most turbulent in Arsenal's history. After the sacking of George Graham, due to him being found guilty of accepting illegal payments in transfer dealings, Rice was promoted to part of the first-team coaching staff. A season later, Bruce Rioch was sacked after only a year in charge at the helm. 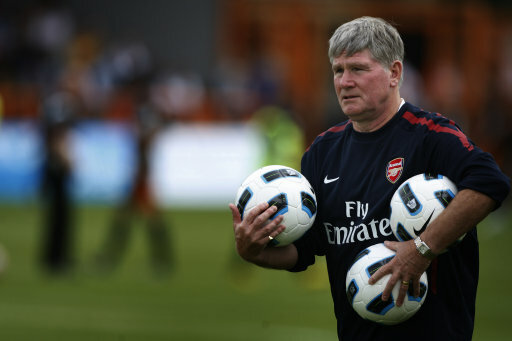 In the interstitial between Rioch's departure and Arsene Wenger's arrival, Rice was pressed into taking charge of the squad, and has been Wenger's lieutenant on the sidelines ever since. Rice has always been an understated individual, and accepted the added responsibility at Arsenal reluctantly. But his love for the club superseded any personal hang-ups, and whatever role was required of him, he did without complaint. Some have looked upon Rice negatively in recent seasons, calling him a "yes man", something of a pushover, and useful only for laying out the cones in training. I've always found this appraisal very unfair. There's seems no doubt that he's not a man who takes to the spotlight, and may not be the most shrewd No. 2 in the game. But Wenger has clearly valued him enough to keep him as his right-hand man for his entire tenure in North London. So much so, that Wenger was rumoured to have talked him out of retiring at the end of last season. And for those who bemoan Rice's presence during the current trophy drought, let's not forget that he was also there during the Premier League titles, FA Cups and the unbeaten league season. Pat Rice is no football genius, but neither is he a complete dolt. As he walked around the pitch, inconspicuously waving, and demurely taking the applause from the fans who remained in the stadium on Saturday, I hope he understood just how much he was appreciated by some. It was the last time that the home crowd will see a man who was the ultimate foot soldier; a decent individual who always did his best for Arsenal, never carped, and went about his business in a quiet, dignified manner. These are qualities that have always been associated with Arsenal, going back to the early 20th century. In this "microwave-era", where gratification is demanded instantly, let's hope that with Rice gone, the club doesn't lose the sense of decency that was always inherent in the man.